Display fits a mini helmets, not meant for full size helmets. 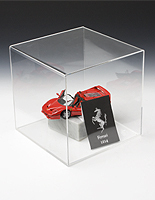 Collector display case made from Injection Molded Polystyrene, cheaper than acrylic! Lift-Off top design ensures easy insert and removal! 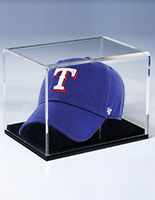 Covered display keeps your nicest sports memorabilia safe! Black MDF base coordinates with many décors! 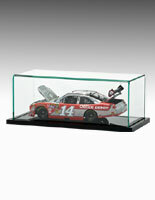 This plastic collector display case is perfect for all your memorabilia! Be it football, baseball, hockey, or just a coin, this showcase is ideal to show off that favorite sports keepsake at home, or even at a store! 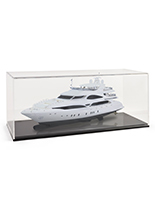 This showcasing item, NFL collector display case is a much more affordable alternative to acrylic and proves essential to housing a favorite collection. 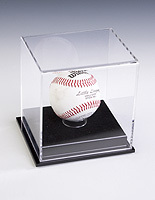 Fans of sports like football and baseball love the displaying options this holder offers. This collector display case, that is dependable, also known as a showcase cabinet, keeps treasured NFL logo keepsakes displayed with the utmost care. 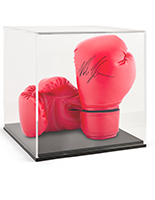 Valuable memorabilia is shielded from harm while still clearly viewable. 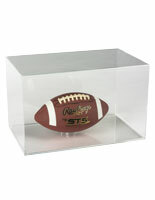 Users can dress to impress with this football and baseball collector display case that is also a bargain! The base is crafted from medium density fiberboard, or MDF wood, and the casing from injection molded polystyrene which has a similar look to glass. This enables the coin collector display case that is light to be much cheaper than its acrylic counterpart. While the casing is much thinner, it will not break as easily as glass. Polystyrene is also very similar in appearance to acrylic, so that favorite logo will be seen with extreme clarity in these cabinets. To access the interior, simply lift off the top. The fixture is great for NFL memorabilia, but conveniently, also can hold an autographed baseball, dolls, die cast models, coin collection, and other small sports items and collectibles. 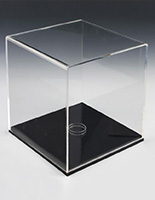 This showcase holds objects 8" wide, 5" tall, and 6-1/4" deep - designed for mini helmets. Please Note: This display is meant for mini helmets only, it will not hold full size helmets. 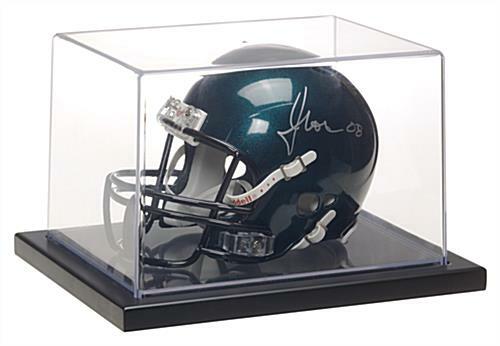 32.0" x 5.8" x 7.6"
8.0" x 5.0" x 6.3"
I am a collector of sports memorabilia and these are the best mini helmet display cases out there. Thanks! The display case is very nice. However, it was supposed to come with a piece of turf to place in the bottom, which I did not receive. I was disappointed with that. Hi Debbie, We're glad you're happy overall with your purchase. However, one of our customer care specialists will be reaching out to ensure that you receive all the necessary parts.